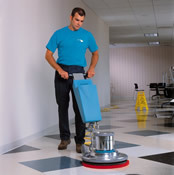 Quality, professional janitorial cleaning services are important for two reasons. First, a well-maintained office building speaks well for the company and presents a professional atmosphere to potential clients. Second, a cleaner office space means healthier, more productive employees. You want your facility clean and secure at an affordable price. At ServiceMaster® Capital Area we strive to combine excellent customer service with proven cleaning systems to provide a janitorial program specifically tailored to your needs.